Yorkshire Diamonds’ captain Lauren Winfield believes her side can use the momentum gained from their first win of the Kia Super League when they welcome Western Storm to Scarborough tomorrow. The Diamonds earned their first victory of the summer with a 12-run win over the Southern Vipers on Thursday to lift themselves off the foot of the table. Yorkshire posted 175-5 from their 20 overs, the Diamonds’ highest total in the KSL and the second-highest by any side, before Katherine Brunt took 5-26 to restrict the Vipers in reply. “Hopefully that’s a bit of momentum for us to build on that first win,” said Winfield, whose side lost three of their opening four matches with the other one being a no-result due to rain. “We probably could have got 20 or 30 more runs than we did. But fortunately the early wicket of Danni Wyatt took the sting out of their attack a bit. “The best thing about it is that 10 games is a long competition and you don’t want to peak too early. “As long we take belief from that win and keep doing our things well, I’m sure we’ll be just fine. “I just wanted that one win on the board to lift the spirits of the group. Things don’t get any easier however, as tomorrow’s opponents Western Storm, sit second in sit second in the standings after yesterday’s seven-wicket win over Lancashire. The best thing about it is that 10 games is a long competition and you don’t want to peak too early. “The Storm will be a challenging game again,” said Winfield. “They’re a team with momentum. “But a lot of our players put their hands up with the bat and ball against the Vipers. “It’s not necessarily a one-man band for us. Those improvements in the bowling department will be critical against a Storm side who comfortably chased down 162 in 15.3 overs against the Diamonds when the two met in the opening game of the KSL at Taunton last month . 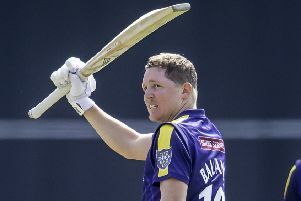 In that game, the Storm’s Heather Knight struck a superb 97, but it is Smriti Mandhana in particular that has been in fine form, hitting 180 runs to make her the leading run scorer in this year’s KSL. Winfield is wary of the threat posed by Mandhana, after seeing the damage she can do first hand when the Indian international hit 48 off 20 balls against the Diamonds. She said: “A lot of their runs have been scored by Mandhana. She’ll be a huge wicket for us so we can have a look at the rest of their order who haven’t had a lot of time in the middle as a result of that. Winfield herself has been in fine form, and is the Diamonds’ top run-scorer with 133 runs so far. The Diamonds captain hit 41 against the Storm, but her most impressive innings was a 38-ball 64 last time out as she top-scored against the Vipers. “The way I’m going, I’m really pleased after not much cricket this summer,” she added. Yorkshire Diamonds take on Western Storm tomorrow at the North Marine Road Ground, Scarborough, from 2.30pm.